← What is your favorite piece of jewelry? Facebook’s CEO, Mark Zuckerburg, decided to take a different approach in purchasing a non-traditional style engagement ring for his wife Priscilla Chan. The ring is estimated to be around $25,000. It has a central ruby, with diamonds on either side. It looks very similar to this ring pictured above. Some information about rubies: The Ruby is named after the Latin word “ruber” for red. Ruby is one of the most expensive gems, large rubies being rarer than comparable diamonds. Many rubies are an essential part of royal insignia and other famous jewelry. Diamonds are graded using criteria that have become known as the four C’s, namely color, cut, clarity and carat weight. Similarly natural rubies can be evaluated using the four C’s together with their size and geographic origin. What do you think about non-traditional wedding rings? Would you wear one? See our lovely Ruby collection online. 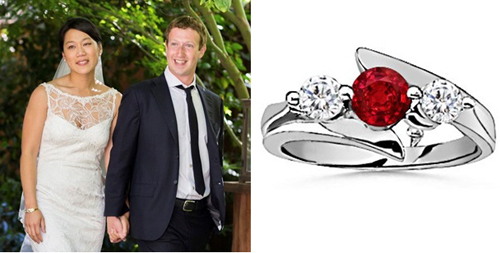 This entry was posted in Jewelry and tagged facebook, facebook wedding, mark zuckerburg, priscilla chan, ruby wedding ring. Bookmark the permalink.